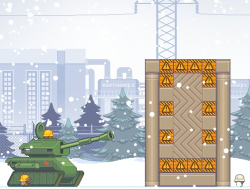 The demolition team from this miniclip game was called to the great capital of Russia, Moscow. There are lots of buildings to be brought down there and you should figure out ways to do this by using the items in your inventory. Place bombs on the nitro packs and then detonate them to do some massive damage to the walls. Also there will be some other objects you should take in consideration when blowing up the buildings. Try to keep the civilians safe and dont hit the other buildings that do not need to be demolished. Rubble Trouble Moscow 10.00 between 0 and 10 based on 2 votes.